Interstate 59 angles northeasterly from New Orleans through the Deep South to Hattiesburg, Meridian, Tuscaloosa, Birmingham and Chattanooga. The freeway sees a 153-mile overlap with Interstate 20 between Meridian and Birmingham, marking one of the longer overlaps in the Interstate System. 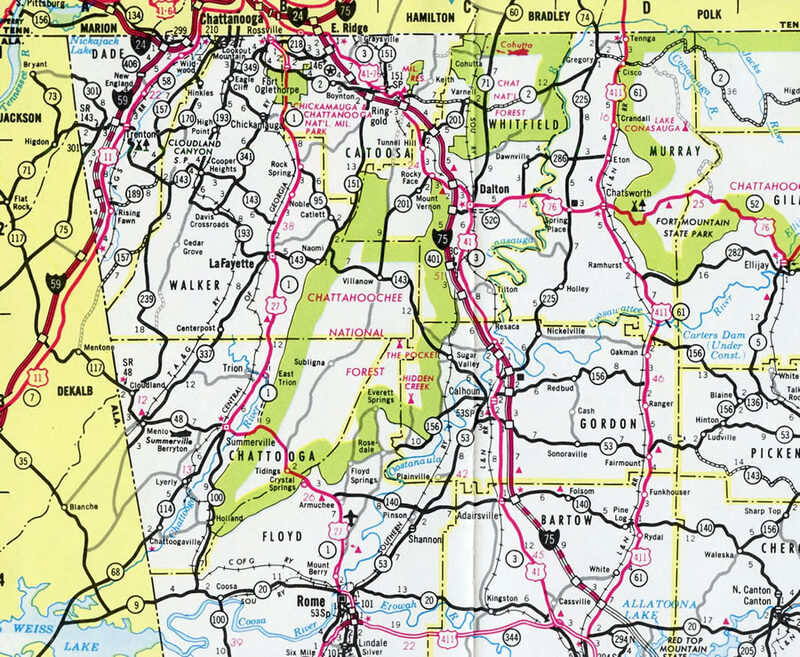 U.S. 11 follows the entire length of Interstate 59 as well as Interstate 81; the likely reason why these two highways do not carry the same number is the lengthy stretch of Interstate 75 that follows U.S. 11 between Chattanooga and Knoxville. Although never actually making it into New Orleans, Interstate 59 provides an important evacuation and trucking route for the central Gulf Coast. The southern terminus is located at the same interchange as the eastern terminus of Interstate 12. This interchange is located where Interstate 10 curves from the New Orleans metropolitan area eastward to the Mississippi Gulf Coast. At one time, plans called for I-59 to be routed south along I-10 into New Orleans, but those plans changed with the decision to route I-12 north of Lake Pontchartrain. Heading north from Louisiana, Interstate 59 follows a forested route through Mississippi, which is a general constant along most Deep South freeways. Hattiesburg (home of the University of Southern Mississippi), Laurel and Meridian are all important destinations in Mississippi. The freeway sees older urban stretches through the latter two cities. Of those, the S-curve in Laurel was notorious for its tight radii, narrow bridges and short exit ramps. It was modernized by September 2009. Interstates 20 and 59 combine from west of Meridian, Mississippi northeasterly to Tuscaloosa, with the University of Alabama and the spur Interstate 359, and Birmingham, Alabama. The pair split with Interstate 459, the Birmingham belt line, at Bessemer City, as they bee line for Downtown Birmingham and an elevated viaduct east of the “Malfunction Junction” interchange with Interstate 65. A four-year $450-million project replaces the 1971-built roadway between I-65 and U.S. 31 & 280 (Red Mountain Expressway) with a new viaduct system. Construction by late 2016 or 2017 involves the entire shutdown of I-20 & 59 by Downtown so that crews can demolish the old roadway and replace it. Read more details about the I-59 / I-20 Bridge Replacement Project on the guide for Interstate 20. East from Downtown, I-20 & 59 part ways by Birmingham Shuttlesworth International Airport (BHM) to Irondale and Trussville respectively. The section of Interstate 59 northeast of Birmingham straddles the southern reaches of the Appalachian Mountains, amid scenic settings. The route serves Gadsden, home of another spur route, Interstate 759. I-59 enters Georgia and ends at Interstate 24, with I-24 providing the link to I-75 at Chattanooga, Tennessee. Interstate 59 follows U.S. 11 for its entirety between Slidell, Louisiana and Wildwood, Georgia. Short overlaps also exist with U.S. 98 along the west side of Hattiesburg, U.S. 84 through Laurel and U.S. 80 at Meridian, Mississippi. 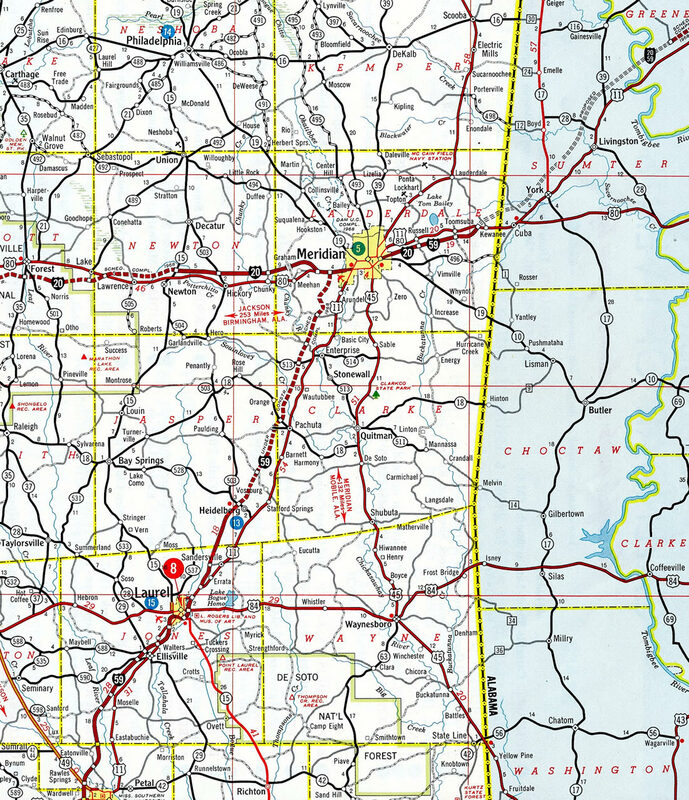 U.S. 11 & 80 combine from Meridian east to Cuba, Alabama, where Interstate 85 may someday end. Northeast from there between Eutaw and Tuscaloosa, Alabama, parallel U.S. 11 combines with U.S. 43. Within Birmingham, U.S. 78 ties into the I-20 & 59 overlap both west of Downtown and east at Irondale. 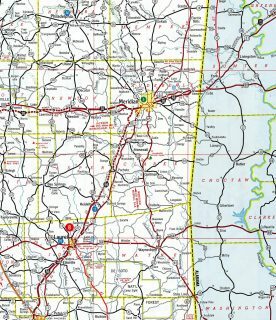 U.S. 411 begins in Leeds to mirror the course of I-59 northeast to Gadsden and Weiss Lake in Alabama as well. Within Louisiana, Interstate 59 was constructed first across the Pearl River as the replacement route for U.S. 11 at St. Rose in 1958. The stretch southward into Slidell, along with Interstate 10 south to the Twin Bridges opened in 1965-66. Completion of Interstate 59 through North Georgia occurred in 1971. The final push of Interstate 59 north takes the freeway between Tatum Mountain and Slygo Ridge to the unnumbered three-wye interchange with Interstate 24. The initial guide sign appears at the Dugan Loop Road overpass. Photo taken 11/03/11. Expansion of I-59 north completed in 2004 added a third lane to the ramp split for Interstate 24 northwest to Murfreesboro and Nashville and east to Wildwood and Chattanooga. Photo taken 11/03/11. The split of Interstate 59 into the respective directions of Interstate 24. Chattanooga is ten miles to the east at this point. The Tennessee capital city is 135 miles to the northwest. Photo taken 11/03/11. This ground level sign for I-24 was replaced with a new sign attached to the adjacent Dugan Loop Road overpass. Interstate 24 dips into the Peach State for 4.12 miles as it circumvents Raccoon Mountain. Photo taken by Chris Patriarca (02/01/03). Replaced by July 2003, this sign bridge retained the sequential exit number of four for Interstate 24 west to Monteagle, Tennessee. Photo taken by Chris Patriarca (02/01/03). This set of signs was also replaced by summer 2003 during the project to add a lane to I-59 north. Photo taken by Chris Patriarca (02/01/03). Interstate 24 retains its Tennessee exit numbering scheme while within Dade County, Georgia. Therefore instead of Exit 1, the northern terminus of Interstate 59 is numbered Exit 167. Photo taken 06/25/12. Interstate 24 westbound expands to three lanes in anticipation of the left-hand ramp (Exit 167) for Interstate 59 south southbound departure of Interstate 59. This diagrammatic sign was installed by June 2003 to coincide with 2002-04 expansion of I-24 to Exit 167. Photo taken 06/25/12. Slygo Road spans Interstate 24 just ahead of the Exit 167 separating with Interstate 59 south. I-24 sees dual control cities of Nashville and Birmingham from I-75 in Chattanooga to this split. Photo taken 06/25/12. Interstate 24 turns northwest to reenter the Volunteer State in 1.4 miles through Paris Hollow. 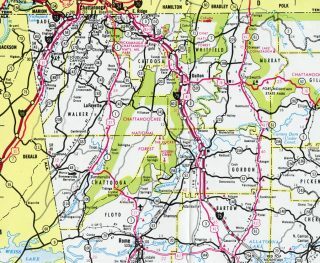 Interstate 59 travels southwest through Slygo Valley en route to New England and Trenton. The scenic freeway reaches Alabama’s largest city in 127 miles. Photo taken 06/25/12. This original button copy sign for Interstate 59 south was replaced sometime after August 2003. Photo taken Chris Patriarca (07/14/03). These signs were replaced by August 24, 2003 to reflect the second lane for Interstate 59 south at Exit 167. Photo taken by Chris Patriarca (02/01/03). Tatum Mountain appears in the background as Interstate 24 west split with the southbound beginning of Interstate 59. Photo taken by Chris Patriarca (02/01/03). Curving south between Windy and Aetna Mountains, Interstate 24 approaches both the Georgia state line and Interstate 59. The forthcoming state line represents the boundary between Central and Eastern. It follows the Alabama/Georgia line to the south and bypasses Chattanooga along the Marion/Hamilton County line to the east. The boundary used to be situated further east, with Atlanta and Chattanooga both located within Eastern Time Zone. Photo taken by Chris Patriarca (02/01/03). Just south of the state line, Interstate 24 east expands to three lanes to the three wye interchange (Exit 167) with Interstate 59 south. This expansion took place during 2002-04 Photo taken by Chris Patriarca (07/14/03). Interstate 24 east enters a valley fed by Pope Creek between Tatum Mountain, Raccoon Mountain and Slygo Ridge. Interstate 59 angles southwest from here through Slygo Mountain to New England. Photo taken by Chris Patriarca (07/14/03). Interstate 24 curves back to the northeast and returns to Tennessee in 3.2 miles as Exit 167 departs for I-59 south. Interstate 59 is a lightly traveled and scenic route from Dade County, Georgia southwest to Fort Payne and Gadsden, Alabama. Photo taken by Chris Patriarca (07/14/03). Emerging from Paris Hollow along Interstate 24 east ahead of Interstate 59 south. Button copy signs remained in service along the I-24 east approach to I-59 (Exit 167) until summer 2003. Photo taken by Chris Patriarca (02/01/03). Original button copy overheads posted at the southbound beginning of Interstate 59 (Exit 167) from I-24 east. The second lane for Exit 167 was restriped into a chevron during 2003 road work. Photo taken by Michael Summa (1984). This sign bridge was removed and replaced by summer 2003 to reflect the eastbound lane drop for Interstate 59 south. Photo taken by Chris Patriarca (02/01/03). Having just split with U.S. 11 at Exit 3, Interstate 59 southbound presses towards the terminus with Interstates 10/12 at Exits 1A/B. Photo taken 05/09/15. Exit 1A joins Interstate 12 west across the north side of Slidell. The intrastate route heads west to Covington, Mandeville and other Northshore communities along Lake Pontchartrain. Photo taken 05/09/15. Beyond the Exit 1A departure to Interstate 12 west, Interstate 59 partitions into Exits 1B/C for Interstate 10 below the I-12 mainline. Photo taken 05/09/15. Travelers continuing south to New Orleans join three westbound lanes of Interstate 10 ahead of U.S. 190 (Gause Boulevard) in Slidell. A seven mile drive carries motorists into Mississippi via Interstate 10 east from Exit 1B. Photo taken 05/09/15. This sign bridge, since removed, revealed that the mainline of Interstate 59 transitioned into Interstate 10 westbound. Access to Interstate 10 eastbound to Bay Saint Louis also continues straight toward a loop ramp at Exit 1B. Photo taken 08/20/01. More photos showing older guide signs for the junction of Interstates 10-12-59 are posted on the Interstate 59 South – Louisiana highway guide. Interstate 10 eastbound at the Exit 266 off-ramp to U.S. 190 (Gause Boulevard) and the city of Slidell. Exits 267A/B for Interstate 12 west and 59 north follows in 1.5 miles. Interstate 10 maintains six lanes through the city of Slidell and reduces to four east of the Interstate 12 and 59 junction. Photo taken 04/20/12. Continuing north from U.S. 190, Interstate 10 prepares to give way to Interstate 59 northbound as it returns to an easterly trajectory. The control city of Interstate 10 is listed as Bay Saint Louis, the first city of any consequence in the state of Mississippi. Interstate 10 eastbound also serves the greater Biloxi-Gulfport area, Pascagoula, and Mobile, Alabama, within the next 100 miles. Photo taken 04/20/12. The eastbound lanes of Interstate 10 transition into the northbound beginning of Interstate 59 to the left. Interstate 10 adds a fourth lane to the right and reduces to two through lanes as it turns eastward toward Pearl River Wildlife Management Area and the NASA John C. Stennis Space Center. Photo taken 04/20/12. Guide signs for Interstates 12 and 59 were replaced, north from Exit 266, in 2000. U.S. 190 ends seven miles to the east of Interstate 10 at White Kitchen. Photo taken by Jeff Royston (05/27/00). A loop ramp joins Interstate 12 east from U.S. 11, 1.5 miles ahead of the directional cloverleaf interchange with Interstates 10 and 59 north. Photo taken 05/09/15. A lane drop for I-12 east occurs at the off-ramp (Exit 85A) for Interstate 10 leading back to New Orleans. Exit 85B follows as a loop ramp for the northbound beginning of Interstate 59. Photo taken 05/09/15. Traffic heading southwest along I-10 to New Orleans partitions from the final stretch of Interstate 12 east. A loop ramp (Exit 85B) to Interstate 59 north follows in one quarter mile. Photo taken 05/09/15. A loop ramp joins I-12 east from I-59 south ahead of the departure for Interstate 59 north. Interstate 59 ventures north to industrial areas at Pearl River before plying across wetland areas associated with Pearl River Wildlife Management Area. Photo taken 05/09/15. Interstate 12 east defaults onto the left-hand side of Interstate 10 east ahead of Harrison County, Mississippi. Interstate 59 north meanwhile combines with U.S. 11 between Pearl River and Nicholson, Mississippi. Photo taken 05/09/15. Two lanes of Interstate 12 east reached the off-ramp (Exit 85A) for Interstate 10 west. Interstate 10 reaches the New Orleans city line in 11 miles. Photo taken 10/04/01. 2000 installed signs noting the sharp curve of the Exit 85B loop ramp were carbon copied after 2012. Photo taken 10/04/01. Spanning the West Pearl River, Interstate 10 approaches both the Louisiana Welcome Center and the two mile approach to Interstates 12 west and 59 north. Photo taken 05/19/14. A frontage road appears along side I-10 leading west to Louisiana 1090. Louisiana 1090 arcs northwest to end at the first Interstate 59 interchange, opposite of U.S. 11 west to Pearl River and Alton. Photo taken 05/19/14. Three lanes extend west from the Louisiana Welcome Center to the split of Interstates 10 and 12 west (Exit 267B). I-10 veers southward from Slidell to New Orleans while I-12 straddles northern reaches of Lake Pontchartrain en route to Covington and Hammond. Photo taken 05/19/14. Interstates 10 and 12 west partition on the north side of Slidell. The initial stretch of I-12 west carries drivers bound for the northbound beginning of Interstate 59. Photo taken 05/19/14. Exit 267B departs a short distance beyond Interstate 10 for Interstate 59 north to Pearl River and Picayune, Mississippi. U.S. 11 north merges with the freeway at Exit 3. The US route also meets the first interchange of Interstate 12 at Exit 1. Photo taken 05/19/14. Additional coverage of Interstate 10 west at Interstates 12 and 59, including replaced guide signs, at Interstate 10 West – Mississippi to New Orleans East highway guide. Interstate 59 travels between several residential neighborhoods en route to Pearl River. Pictured here is the first northbound shield. Photo taken 05/19/14. “Interstate 59 – Realigned interstate trades hazardous history for a safer future.” https://garverusa.com/markets/transportation/42/interstate-59/ Infrastructure Quarterly, 2009 Volume 1 Issue 2. “Improving highway safety – Accidents down on I-24, I-59 after improvements, officials say.” Chattanooga Times Free Press, September 14, 2004. Page updated February 18, 2016.